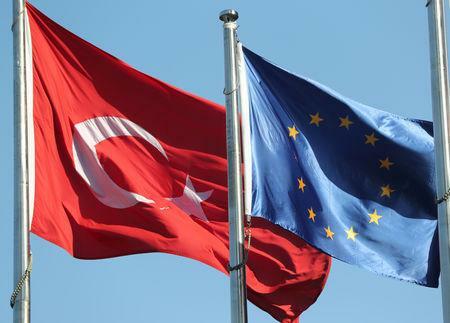 ISTANBUL (Reuters) - Turkey criticized on Thursday as "unacceptable" a vote by the European Parliament Foreign Affairs Committee calling for the suspension of EU accession negotiations with it. The Foreign Affairs Committee called on the European Commission and member states on Wednesday to formally suspend EU accession negotiations with Turkey, citing disregard for human rights and civil liberties, influence on the judiciary, and disputes over territory with Cyprus and other neighbours. Turkey says EU membership remains one of its top strategic goals even though the accession talks, formally launched in 2004, have been stalled for years. Some EU leaders and officials have called for them to be ended. "My expectation is that in two weeks a large majority of the EP will vote for the suspension of accession talks w/ Turkey, as EP Foreign Affairs (committee) did today," Kati Piri, EU Rapporteur on Turkey, said in a tweet on Wednesday, referring to the European Parliament. In October, President Tayyip Erdogan said he would consider putting Turkey's long-stalled bid to join the European Union to a referendum, signalling exasperation with a process he says has been waylaid by prejudice against Muslims. "Human rights violations and arrests of journalists occur on an almost daily basis while democracy and the rule of law in the country are undermined further," European Parliament member Marietje Schaake said in a statement. "This, in combination with the constitutional changes has made Turkey's accession to the European Union impossible at this stage. The message of the Parliament today is crystal clear. We attach consequences to Erdogan's authoritarian grip on power."